Is there a standard approach to becoming an Architect? I'd consider that there is a standard pattern to becoming an Architect, but the individual steps on each individuals journey is likely to vary quite a bit based on drive, opportunity and situations that arise allowing an individual to move forward. A foundation element in this approach, whatever the specific path, is that the individual works through the existing discipline, rises to the top in recognition and moves up or sideways to gain more experience or responsibility. In this way the individual is building both breadth and depth of experience in a variety of fields. A repercussion of this is that eventually the individual ends out with a broad range of experience across several disciplines. This makes them an ideal candidate to step into Architecture, whether that was their intended goal or not. You can test this out, do a straw poll in your office, how many people intentionally 'become an Architect' instead of 'naturally fell into it after a career in many other disciplines'? Breaking down the above image we can see that a common career trajectory into Architecture is via several disciplines. Once a person hits a certain level of maturity in the discipline they currently in, they expand their skillset by moving around, or up. As the person gains skills and moves upward each movement becomes harder and harder as the roles gain in seniority, and availability. 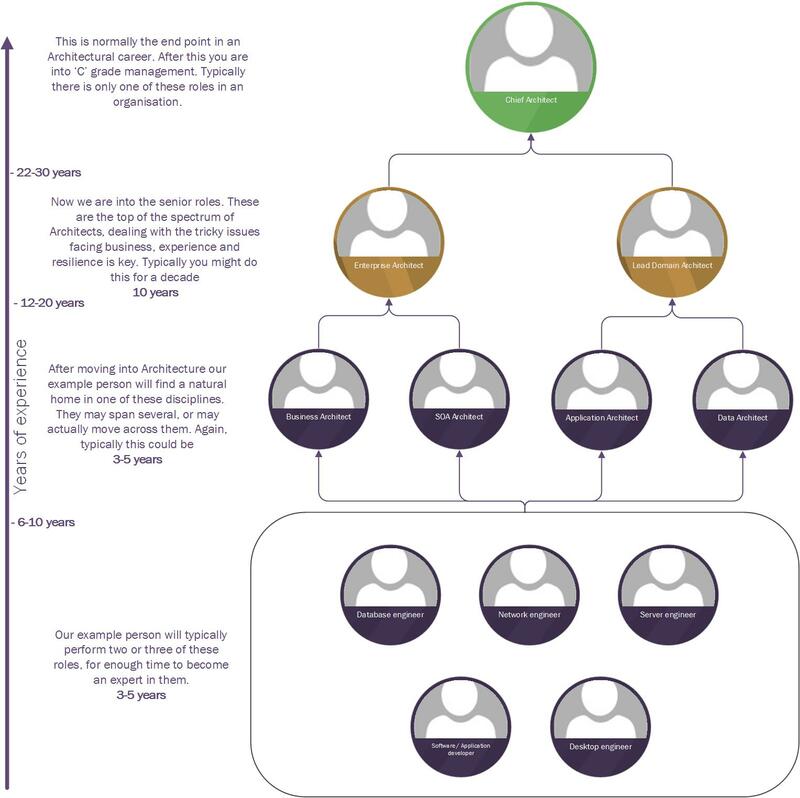 From bottom to top is a shrinking model of available roles, with each position above typically having a significantly smaller number of positions available at each level. This arrives at an end point with the chief Architect role, which is typically a single role within an organisation. As above in my intro, this model encourages individuals to gather both breadth and depth of skill in each field. This depth of background experience is one of the key components that allow an Architect to successfully complete normal architectural tasks, such as decision papers and end to end solution assurance. One element of this that is especially true is an Architects ability to understand all the different aspects of a solution, and being able to play that solution back in a format suitable for a variety of stakeholders, at their level of view. This interpretation of a solution, played into the Business stakeholders is a key skill for Architects as it allows them to convey often complex, difficult solutions to key business representative in a consumable format for them. This Assurance role gives clarity to the business on the fact that defined solutions are aligning to their strategy, and that the project spend is delivering what they want, and what they think it is delivering. Think of it as, Assurance requires credibility, and credibility only comes from established, evidenced experience. Its been a full year since I took on a complete Architecture role. Previously I'd been an Architect / Development Manager / Project Manager. Stay in development long enough and you'll end out taking a path away from 'straight' development into a speciality or more focussed specialisation. A few things have taken me by surprise in the last year in terms of the specific change to a pure Architectural role. One of these is the Governance angle. Good old Wikipedia has a pretty extensive article on exactly what Governance is here: http://en.wikipedia.org/wiki/It_governance but that doesn't really explain what it is in practice. So I always knew that being an Architect (of any of the disciplines 'IA,TA,EA' etc) would involve quite a lot of discovery and design work. But I had not anticipated just how much of a Governance role it involves. Designing and communicating technical specification is pretty standard legwork, but without the added angle of Governance on top of it what you are essentially doing is 'recommendation' over management. In real terms day to day Governance within a large organisation takes the form of both project aligned IT direction and an overall company wide IT strategy view. By this I mean that as an Architect we have to ensure that whatever is going on within the company aligns to the overall Architectural principles and core strategy that have been stated by IT Management. We are in effect 'policy enforcers'. This is an incredibly empowering role to fill within a project / company. It often means that you are the last person to sign off on something, or viewed as the key decision maker. This also means you are often the person that says 'No' to something. 'No. is a tricky option for ex developers turned Architects. Personality wise I'm a bit of an enabler. I think IT allows businesses to accomplish their goals effectively and more often than not I'm pushing the scope of what was requested to try and increase the options IT systems provide. Saying no goes right against this principle, so more often than not 'No' is often followed by several other options. Never appear to be a block, a dead end, to something, you'll soon probably find your business support disappearing. The scale of this Governance role has been the biggest surprise. It has certainly given me a different view of 'in practice' Architecture roles. If you aren't shy about shaping company wide decisions and enjoy technical process then I'd recommend looking into Architecture as a role. Next time I'm talking about stakeholder management, which has also been a journey of revelations.